Posted August 25, 2010 Comments Off Share on Twitter! Kids are natural detectives, always asking questions, trying to find out why or how something works. I think that’s what makes Doyle and Fossey, Science Detectives so appealing. Fifth graders Drake Doyle and Nell Fossey work together as science detectives, solving mysteries in their neighbourhood and for their friends. In Sterling Publishing’s The Case of the Crooked Carnival (age 9-12), written by Michele Torrey and illustrated by Barbara Johansen Newman, Drake and Nell solve cases involving ghosts haunting a house, aliens taking over the wetlands, a crokked carnival game and a wobbly bridge. In each case Drake and Nell use scientific techniques to solve the mystery: they investigate and ask questions (they always seem to have a notebook on hand and a pencil tucked behind their ear), create an hypothesis, observe and record their results and make their conclusions. Although the idea of a fiction book for kids with science weaved throughout appealed to the parent in me, I wasn’t sure my kids would buy it. But a few pages in all 3 of my kids, well the 6 and 8-year old, were hooked. I must admit I was surprised at how attentive even my 3-year old was when we read the book together. The Case of the Crooked Carnival contains four mini mysteries. They aren’t related or connected so you can read anyone of them in any order. With the whole mystery contained in only a few chapters, they made great reads for an afternoon or just before bed. I loved reading the chapters in one of the mysteries except the last one and leave that for the next days. My kids would be clamouring to read the final chapter. Although I felt the characters of Drake and Nell to be a little unrealistic, my kids either didn’t notice or didn’t care. My kids loved how Drake and Nell used deductive reasoning and sound investigative techniques to solve the mysteries, on their own. Adult roles were rare and more background information than anything. I was pleasantly surprised that my kids knew some of the scientific terms already from school, especially my 6-year old. You could see how proud he felt knowing these things and explaining them to the rest of us in his own way. Along with the mysteries, the back of the book also contained Activities and Experiments for Super-Scientists. It talked about creating your own lab and the Scientific Method and how to use it. It also included some experiments the kids could do themselves, though the one with the battery would need parent supervision. The experiments included were based on things Drake and Nell actually did to solve the mysteries in the book. My kids especially loved the secret code portion. There are currently 4 other books available in the Doyle and Fossey, Science Detectives series: The Case of the Gasping Garbage, The Case of the Graveyard Ghost, The Case of the Mossy Lake Monster, and The Case of the Barfly Birthday. Plus there’s a new book due out this September: The Case of the Terrible T.Rex . I think my kids will be keeping their eyes peeled for that one. Posted August 23, 2010 Comments Off Share on Twitter! I am forever getting lost in a path of website links which inevitably lead me somewhere or to something I was just not expecting. Fortunately, this journey is often a positive experience unless of course I venture so off course and become distracted for several hours or days and lose focus on the task at hand. This is of course how my blog research started and luckily ended with fascination, awe, good information and an on-line purchase! I had been planning a post to share the numerous websites and blogs which focus and feature information on school lunches. I started out with a fave www.fedupwithschoollunch.blogspot.com which chronicles Mrs Q’s commitment to eating the not always appetizing or healthy daily school lunch provided in her school. Mrs. Q is a wonderful voice for school lunch reform in the USA and has an amazing blogroll list of “Big Players in School Lunch Reform” plus some amazing links to parent blogs etc. If you enjoyed Jamie Oliver’s Food Revolution and are interested in the larger picture of food and nutrition reform you will enjoy her blog. I had planned to include Mrs Q blog plus some links to companies providing unique and interesting products to package lunches. Before I got to those sites, I of course had to check Mrs Q’s blogroll and this is exactly where I went off course. Before I knew it, I had fallen down the rabbit hole into the amazing world of Bento school lunch boxes, and believe me, what I discovered was as fascinating as Alice in Wonderland. Here is a quick peak. My first stop was Miranda Bashaw’s Lunch Box Blog. 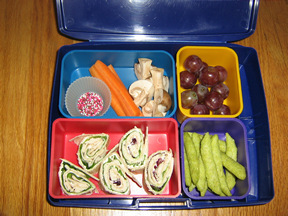 Her blog has a simple accounting of what she serves in her son’s lunch on a daily basis. She photographs the lunch and lists exactly what she included. I also like her tips, recipes and mom talk regarding nutrition, time constraints and daily life with children. My next stop was Melissa’s Another Lunch where my eyes got wide and my jaw dropped at what I can only describe as the ART of the bento lunch box. It was shortly after arriving at Melissa’s beautiful site that I took a quick detour to www.fenigo.com to purchase a set of LapTop Lunch Box systems for my two boys, but more on that later. Be sure to check her posts explaining what Bento is , How to Choose a Bento Box , Tools of the Trade – Picks. Her site is internet eye candy, inspiring and just what you need when packing a lunch is the last thing you want to do. The more I read, the more I realized that Bento lunchboxes are to school lunches what the new scrap booking is to family photo albums. Stop number three was Biggie’s Lunch in a Box which had the most comprehensive resources for Bento FAQ’s, recipes, decorative techniques and product reviews. I particularly liked her post on Bento and the Picky Eater and am hoping to see my eldest son bring home more empty lunch boxes this fall. Check out her Bento Forum and have a look at the Bento Showroom. I am not sure I can commit myself to the art form of bento lunches but I love the idea of having a system of containers for lunch components that is littler less, BPA free and visually appealing. I thought the design would appeal to boys plus be streamlined and not too bulky in a back pack. They can see everything in their lunch so perhaps containers won’t be forgotten or avoided in their lunch bag. I also purchased an extra set on insert containers so I can prep several days in advance. I purchased my Lap Top Lunch system from Fenigo which is an on-line store “For Everything for a Litter-Less Lunch”. It is located in Kitchener, Ontario and started by mompreneur Jana. They have a large selection of lunch container products and a wonderful resource page with links for information regarding BPA and waste free lunches. Posted August 21, 2010 Comments Off Share on Twitter! The mastery of basic facts is critical if students are to develop fluency in working mathematical problems. The negative attitudes many children have about math can be traced to not having mastered the basic facts. Yes, I admit it – I think kids should have to learn math facts – yes! I know it’s boring. I know it’s painful, but it’s not as painful as sitting in a grade 9 math class not being able to factor a binomial or polynomial because you never learned the relationship among the numbers 8, 7, and 56. When I ran a school for students with special needs in Richmond Hill, I taught mental math for a full month before we cracked a text or looked at problem solving. My grade 6 to 9 students learned math facts to 12 x 12, and then they learned how to solve computational problems, such as 15 x 28 or 165 x 23, in their heads. And they loved it. Why? Because they could do it – and it made them feel good (their peers in the public and private systems couldn’t do it) – and when we did get to the various curricula, they weren’t sweating the small stuff. And they weren’t using calculators. ü Spend 7 minutes a day. Every day. Okay, every weekday. ü Work with only 2 new facts at a time. Add them to the existing deck, so your child is reviewing every single day. ü Once you teach a multiplication fact, e.g., 7 x 8 = 56, teach its turn-around fact, 8 x 7 = 56 (just because it’s obvious to you doesn’t mean your child will see it). ü Teach division facts at the same time, with their turn-arounds (56 : 8 = 7 and 56 : 7 =8). ü Put the focus on accuracy first; then worry about speed. ü Try this order (and feel free to build a reward system into this programme). x 0 and x 1 = you can knock these off in a few minutes with most kids. Then the rest, starting with 3 x ……. Don’t become discouraged. Picture a 12 x 12 grid. If you wrote the answers to all those multiplication and division facts you’ve just learned into a multiplication grid, you’d see, there aren’t many left to learn! Don’t stop reviewing just because your child knows the facts this week. Keep it up a few times a week for 5 minutes. Before you protest… I agree. Some children with learning disabilities have to expend too much energy to learn math facts, especially those with dyslexia and memory deficits. For those students, I suggest, not calculators, but fact sheets for addition, subtraction, multiplication, and division. Feel free to contact me if you’d like a sample of our math fact sheets. Mattingly, J. C. & Bott, D. A. (1990). Teaching multiplication facts to students with learning problems. Exceptional Children 56, p. 44. Posted August 16, 2010 Comments Off Share on Twitter! Getting your child to sleep can at times be challenging, especially in the summer when the sun is still shining bright and the older neighbourhood children can be heard outside still playing street hockey or coming back home from an evening play at the park. Ready to wind down for bed and your kids are not? Try the yoga techniques below after a nice calming bath, massage with all natural lotion and jumping into clean and comfortable pyjamas. The following are beneficial to preschool & school aged children. Enjoy and happy sleeping! Have your child lie down on their back in a comfy place (preferably their bed) and close their eyes. Share a story with them using a soothing voice. Maybe a story about becoming a fairy floating in the sky, sitting under a tree doing a quiet activity or becoming a tree that blows in the wind. Invite your child to visualize the images in their mind. Not feeling creative? No problem! There are great guided meditations you can download from iTunes, some even free and wonderful guided meditation books for children available. Childs pose is a very relaxing posture that turns the senses inwards while relaxation and rejuvenation moves through the mind and body. This posture calms the mind inviting your child to prepare for a sleepy slumber. To get into childs pose place your heels under buttocks and move the upper body and forehead to rest on the floor. Your arms may reach back towards your heels or extending in front of the shoulders. Legs up the wall also calms the mind and rejuvenates tired leg muscles and feet from a busy day of running, playing and having fun! Have your child lay on their bed or on a cozy blanket on the floor. Placing their buttocks close to the wall and bringing their legs up to rest on the wall at a 90 degree angle. Your buttocks should be against the wall. Posted August 13, 2010 Comments Off Share on Twitter! When it comes time to buy your child a new backpack, there are some important things to consider. If your child had to make the decision on his/her own, the top things they would think of would be the colour and what design or character is on the backpack! However, as a parent there are a few other things that you should take into consideration when choosing that all important backpack. For example, do you know that some contain no no’s such as BPA, Phthalates, PVC and lead? In this post, I have given you my picks for the safest and most eco-friendly backpacks out there. All of them also happen to be quite cute! These backpacks are made from nylon that has been manufactured with recycled plastic water bottles and trimmed with naturally biodegradable canvas. Each pack removes four 16oz. plastic bottles from the environment. How cool is that? They come in three different designs. Beatrix NY also offers backpacks that are not made from recycled water bottle nylon but are 100% free of BPA, PVC, lead and Phthalates. Crocodile Creek backpacks are PVC, Phthalate, Vinyl free and BPA free and come in 11 designs. Crocodile Creek also offers matching lunch packs. How cute is that bee?! Skip Hop packs are BPA, PVC and Phthalate free. They come in eight different designs and like the others, you can get the matching lunch bag. Since these packs are made from superior materials, they are a bit pricier than mainstream packs. If these don’t fit your budget but you still would like to make the best choice when it come to eco-friendliness and health, make sure that the pack you choose is free from the following: BPA, Phthalates, PVC and Lead. Posted August 12, 2010 Comments(3) Share on Twitter! Have you even thought about Back To School Shopping? 2. Find the right Backpack NOW. Believe me the Hannah Montanna or Iron Man one your child will want will be hard to come by in a few weeks. 3. Lunch Bags also can fall under the same “themed” merchandise as above. Also consider your child’s lunch schedule. Would several compartments work better? Will it hold everything you need? 4. Head to your local Dollar Store for plastic containers and ziploc bags before they run out! Or, check out this post for plastic alternatives. 5. Shoes! Chances are your child will need a pair for both indoor and outdoor. Make it easier on your child and teacher by making sure they easily go on and stay on. 6. Outdoor gear. Jackets with hoods are a plus (lessens the need for a separate rain coat). Umbrellas, Sun/Baseball hats are still good items to have on hand at this time of the year. 7. Scheduling Dentist appointments, Haircuts and Eye tests for later on in August will also help you stay ON TRACK before the big Back To School rush happens. Basically anything you usually leave for the last week of August can be done now for the most part. Don’t run yourself ragged at the end of summer. Kick back and enjoy it. Isn’t that what the lazy days of summer are about anyway? Posted August 11, 2010 Comments Off Share on Twitter! Dragons are big in our house. Okay, not real dragons (though I’m sure my son would be whining to get one if you could get them at the pet store). No I mean the whole idea of dragons. My kids love to play games that involve dragons, draw pictures of dragons, fight dragons in the backyard (with the help of some poor unsuspecting stuffy), they even love reading books about dragons. If the book has a dragon in it anywhere, my kids will want to hear it. In comes Schoalstic Canada’s new book One Drowsy Dragon (age 3-5), written and illustrated by Ethan Long. This fun rhyme follows the frustrations of a very tired dragon who is trying to get some sleep but can’t because of the antics of the other dragons in the cave. One dragon is clanging on a cup, two dragons are playing a noisy battle game all the way to ten dragons who are ready to sleep but even that doesn’t help the Drowsy Dragon. My 3 and 5-year old think this book was hysterical. I’ll never understand a child’s humour. This is a very cute counting book and my kids love the silly antics of the dragons and how they are keeping the one dragon from sleeping. The rhyme is fun and the pictures capture that fun too with their colourful cartoon-like illustrations. The book is great for reinforcing counting and number order; the kids love to count the dragons to make sure they matched the number being talked about. The numbers are written out in text versus being numeric so kids can see another way numbers might appear in a book. I love how the description for the one tired dragon changes as it becomes frustrated and exhausted; it is a great way to expand the kids’ vocabulary. With the catchy rhyme, minimal words, and helpful illustrations, One Drowsy Dragon is a fun book for beginner readers to enjoy as well. The short copy makes it a fairly quick read (if you’re not spending time counting the dragons in the book) so parents won’t go crazy when their kids ask to hear it over and over…and over again.